Trilliums, also known as wake-robins and toadshade, are woodland wildflowers found in the temperate forests of the world, especially in North America. Stumbling across a patch of trilliums flowering in the woods is a rare treat, but it's also possible to grow them in the garden at home. Trilliums emerge from the ground in early spring, before the large forest trees they prefer to grow under have leafed out. Each plant has a single leafless stalk with three leaves at the top. In mid-spring, the flowers appear with three large petals and three smaller sepals. This is followed by a single berry in summer that is divided into three sections. Everything about the plant is perfectly symmetrical. 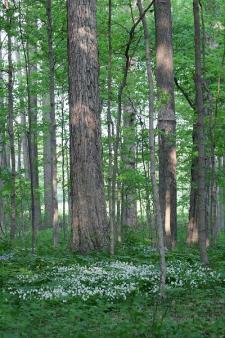 Mimicking the forest conditions where trilliums grow in the wild is the key to success. Filtered light is best as trilliums cannot tolerate much direct sun. The soil needs to be rich in organic matter, well-drained, and moist. If you don't have naturally-occurring hardwoods to plant them under, you can grow trilliums under shade trees, but you will need to enrich the soil with copious quantities of compost before planting. Plant trilliums with other forest perennials, such as heucheras, hostas, and ferns. The foliage fades by midsummer, so it's nice to intersperse them with plants that vibrant throughout the growing season, so the area is not left bare when the trilliums go dormant. 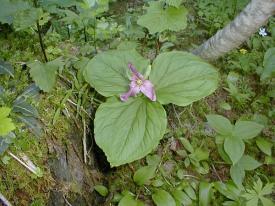 Trilliums grow from underground tubers and will eventually spread to form a large colony though this can take decades. Whether you want trilliums for your shady garden border or if you have a natural woodland on your property where you would like to get them established, you will more than likely be buying them from a nursery rather than trying to grow them from seed. 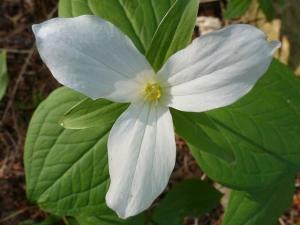 Many species of trillium are threatened or endangered in the wild due to habitat loss and over-harvesting by gardeners. They grow very, very slowly - it can take two years for seed to germinate and another seven years for seedlings to get big enough to start flowering. Never harvest trillium tubers from the wild and be sure to obtain them from a reputable nursery. Because of their slow growth rate, trilliums are among the most expensive ornamental plants to purchase. They are not extremely common in ordinary garden centers, but here are a couple options to order them online. Plant Delights Nursery, Inc. has an impressive selection of trilliums for sale in 3.5 inch pots, ranging from $22 to $32 each. 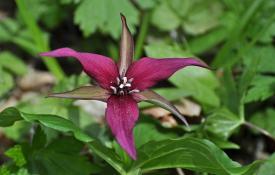 ShadeFlowers.com is a less expensive option, selling groups of three trillium tubers for about $9 each. 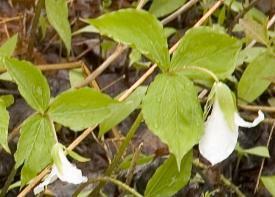 Trilliums have very sensitive roots and should be planted while they are dormant, preferably in late winter as soon as the ground has thawed. Enrich the soil as needed with compost and rake the planting area into a low mound if drainage is poor. Bury the tubers about two inches below the surface of the soil with the fibrous roots pointing down. Water regularly, but not to the point that the soil is soggy. The shoots may be slow to emerge in the first year, so be patient. 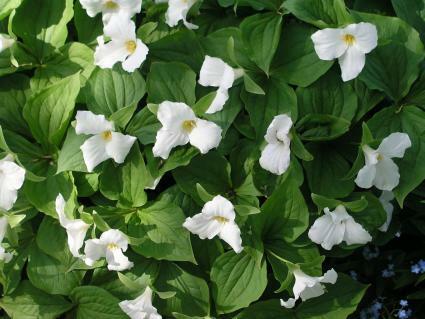 Keep trillium plants mulched with leaf litter from the trees that are growing above. If you're not planting trilliums in an existing woodland setting, it's helpful to spread a layer of compost over the planting area each fall for the first few years to create the rich, spongy soil conditions they require. Cut the flower stalks to the ground as they fade in summer. Once a clump has become well established (starting to expand from the original planting with many new stems each year), they can be divided while dormant in late winter/early spring to spread the plant to other parts of the yard. Try to keep as much soil as possible around the tubers when dividing to avoid disturbing the sensitive rootlets. Getting trillium established is a slow process, but fortunately they are not bothered by pests or disease once they are mature. Trilliums come in a wide variety of colors and should be planted according to the parts of the country where they originate. Trilliums are among the most stunning of all spring ephemerals - forest floor plants that do most of their growing while other species are still waking up from dormancy. During their brief flurry of color, they fill the forest - or woodland garden - with a delightful glow, a welcome reward for the patient gardeners who attempt to grow them.